Ludum Dare: A competition that sees hundreds of game enthusiasts, from hobbyists to professional game developers and everywhere inbetween, get together for a weekend to create…you guessed it… games. This year the theme was ‘escape’, so the 48 hours between the 19th and the 22nd of August saw hundreds of game makers metaphorically battle it out as they – perked up on energy drinks and coffee – went about creating their games from scratch. This competition (Ludum Dare 21) saw 599 entries in total, meaning a further 20 days, 12 hours, 47 minutes and 30 seconds from now are needed to judge the massive number of entries and decided a winner. Markus Persson better known as “Notch” – the high and mighty creator of ‘Minecraft’, took a few days off from developing the blocky sandbox game that is worldwide sensation Minecraft, to a create…. 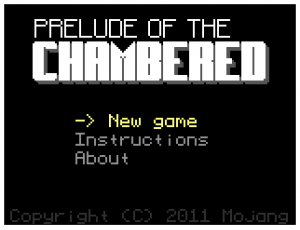 well the blocky dungeon escape game that is ‘Prelude of the Chambered’. I hit space on ‘New Game’ and find myself in a mineraft-esque barred cell, hit a few blocks on the wall that break apart almost identically to clay (or maybe I just play too much minecraft), to find a few hidden passages and I head down a ladder to the next area. 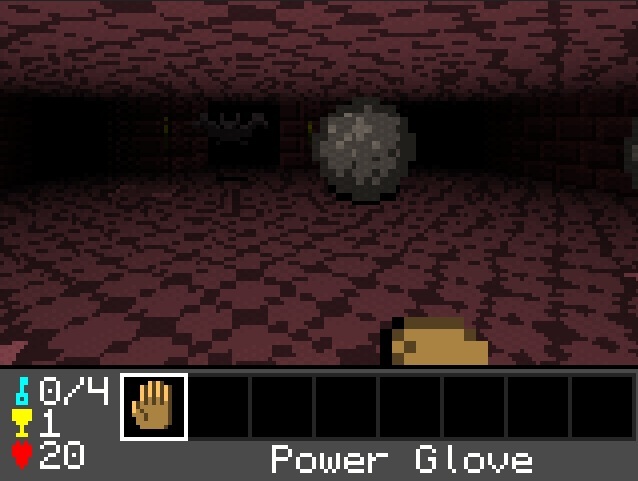 I now find myself in a reddened dungeon world named imaginitively “the dungeon” – which I feel has a distinct ‘nether’ feel about it – and run around more passages to find a golden chest which, once hit, yields a power glove (not a pair, just one, because who needs left hands?). I now find myself able to hit bolders out of the way that were previously blocking the passage. 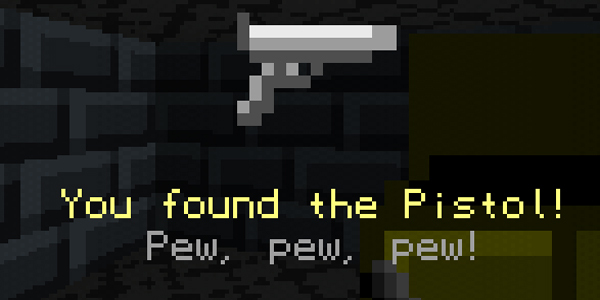 After moving a few bolders about and finding a hidden room or two containing little golden trinkets, I come across a room containing pressure plates, push some bolders, bish bash bosh, another few secret rooms are revealed… I’m given a pistol, a health potion and a room full of bats. Spam the space bar a bit and power glove punch the hell out of them and I’m left eventually with a golden bat who drops a blue key which I’m told is one of four. I exit the world up the orinigal ladder and find myself back in the original world, equally imaginatively named “the prison”. Once again I move a few bolders, kill a few bats and go up a new ladder emerging into “the island”. More dead bats and weird floating blue eyes then enter the “frost cave”. Dispose of yet more blue eyes with my power glove, unlock more hidden rooms, pick up some skates to allow me controlled movement on ice. Do another little puzzle thing and kill a golden orb – I’m starting to see a pattern here… Head back up to the island and cross some ice I can now navigate. pick up some cutters and I can now get through bars. Next comes “the crypt” – filled with mummies that shoot goo, more puzzle doors, more hidden rooms, more trinkets and pistol ammo, pick up some flippers which do a little song and dance… only kidding they just let me swim. A mummy boss (but this time he’s not golden! ), and a third blue key is mine. Once he’s finished and the last blue key is mine, I head back up to the island and unlock a door with 4 key holes, I run into an arena ready to fight whatever is left…..then a message on the screen appears “you win”….. Is that it? goddam it! Now I may be mocking of fomulaic games such as this, I mean they just remind me my Playstation 1 games which, while good at the time make me wonder – why the hell did I ever like them? But seriously, Notch did this in one weekend? It is pretty impressive and honestly, it’s a very nice little waste of half an hour. I would recommend you give it a go, even if it is just reminisce upon your long lost childhood innocence. But it has set me wondering, if Notch can do this in 48 hours, why oh why has minecraft been in development for so long?…it’s been OVER 9000!! !